Keeping the principle of hygiene as its core with a vision to revolutionize wipes and tissues at state of the art manufacturing unit which has passed various global standards. Magic tablet napkins are environmental friendly simple to use to wipe hands, face or remove make – up to stay fresh naturally. By use of tiny bit of water, it’s converted into a magical towel napkin with fragrance of lemon and green apple. High quality hand towel compressed to yield tiny coin shaped tablet napkin also known as SARAL magic tablet napkins. Magic napkins made from rayon pulp is a natural product and does not impact the environment in any negative way making it eco-friendly and 100% biodegradable. Skin friendly, anti-bacterial, chemical free, no preservatives or other harmful chemicals that cause side effects. Coin sized, compact structure can fit in anywhere, easy and lightweight to carry. Available in zip-lock packs, tube packs, candy packs etc. with choice of two scintillating fragrances. The product is widely used in the field of travel, aviation, hospitality, medicine, health care and accordingly can be customized as per your requirement with your branding as shown below. Fresh. Anywhere. Anytime. Suitable for all types of skin. Just pour water and your napkin is ready to use. These wipes are soft and skin friendly and a perfect companion for your skin – whenever, wherever. 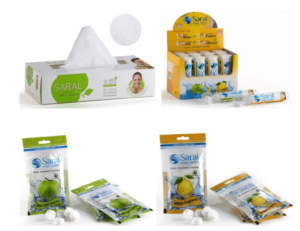 When compare with ordinary water tissues or wipes containing preservatives the advantages are no allergic reactions, rashes or other side effects. You must have experienced ordinary tissues produce an unpleasant smell while used. Further ordinary water tissues when stored for a longer period enhances the risk of bacterial or fungal contamination’s chances. These are available in candy packs (individually packed single packs) of 25, 50 and 100 tablets in each box as shown below. The individual tablets can be packed under your brand wrapper or for lower quantities the outer box can be customized and if required even different pack size can be created to fit your promotional budget. SARAL premium fabric napkins are skin friendly, anti-bacterial, eco-friendly, chemical free available in single ply sheet size of 21 cm x 20 cm in a box containing 50 pieces as shown below. Your branding can be done on the outer carton box or as desired by you to extract maximum mileage out of your promotions. Tube packs containing 10 pieces as shown below and branding can be done on the tubes. Zip lock packs containing 12 pieces as shown below and for large quantities branding can be done on the sachet. Please revert back with your customized requirement to take the same forward.